Cape Disappointment is one of Washington’s favorite state parks. With two functioning lighthouses, the remains of Fort Canby, old growth forests, and rugged stretches of beach, it is a northwest adventure for the memory books. And did we mention the views? 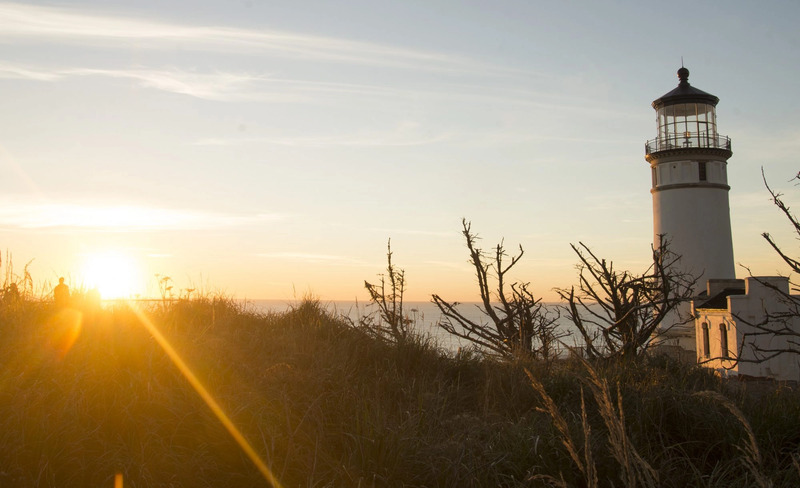 Gaze across the mouth of the Columbia River from the Lewis & Clark Interpretive Center or watch the sun slip beyond the horizon at North Head. Camping, Cabins, & Yurts: Open year round, reservations recommended. Playing on Benson Beach. Photo by Daley Family Travels. These car free beaches are perfect for play and discovery! Spend a day building sandcastles and driftwood forts. Watch the sun kiss the Pacific on a crisp October evening. Hike along Benson Beach with the North Head Lighthouse in view. Watch giant waves crash in the winter at Waikiki Beach or catch a free concert during the summer months. 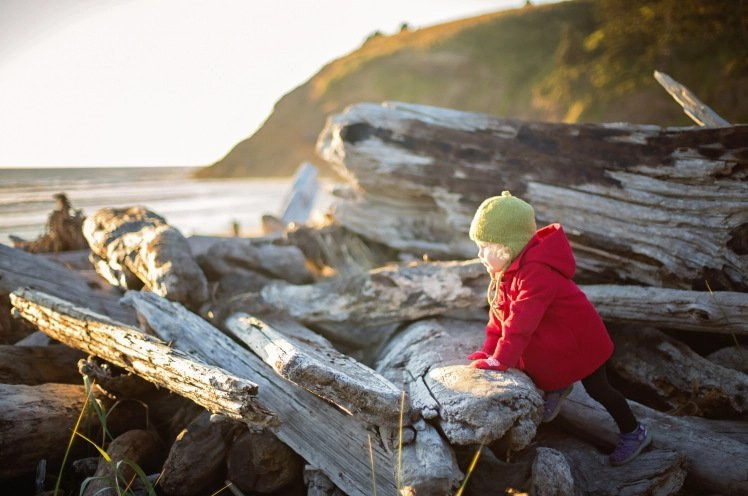 Cape Disappointment’s beaches are meant for exploration! Cape Disappointment has 8 miles of hiking trails! Bell’s View Trail is leisurely and rewards you with a view of the peninsula’s seemingly endless stretch of beach. North Head Trail is a bit more challenging and connects to McKenzie Head where you’ll find an old gun battery. And of course, you shouldn’t leave without hiking to one of the lighthouses. Fall at Cape Disappointment State Park. Photo by Sarah Day. Gun Battery Harvey Allen. Photo by Sarah Day. Visit the Lewis & Clark Interpretive Center to learn about the Corps of Discovery’s journey as well as some maritime history. As an added bonus, you’ll be treated with a panoramic view of the Columbia Pacific Confluence and a great photo op of the Cape Disappointment Lighthouse. Find the remains of Fort Canby throughout the park. Gun Battery Harvey Allen is just outside the interpretive center. 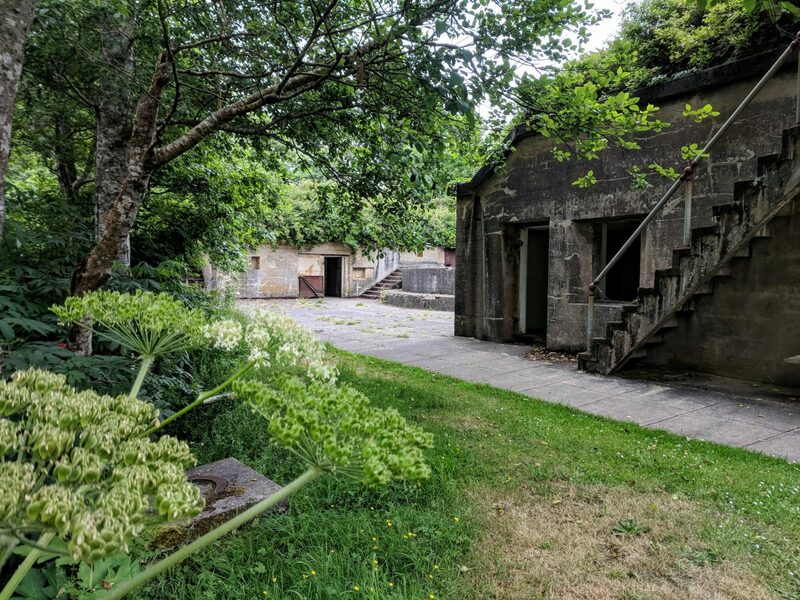 Another gun battery can be found at the top of McKenzie Head. If you enjoy military history, be sure to check out Fort Columbia Historical State Park as well! You’ll find not one but two working lighthouses at Cape Disappointment. The North Head Lighthouse is the easiest to hike to and is usually open for tours in the summer. The short trail is flat and wide enough that it’s possible to get a wheelchair down it. The ride might be a little bumpy, though! The Cape Disappointment Lighthouse can be viewed from the Lewis & Clark Interpretive Center. You can also take the Cape Disappointment Lighthouse Trail to walk right up to it and enjoy the view hundreds of feet above the surf. The North Head Lighthouse. Photo by Jace Walker. Basalt fish cleaning table by Maya Link. Photo by Sarah Day. Maya Lin is best known for creating the Vietnam Veterans Memorial in Washington D.C., but tucked away in Cape Disappointment State Park are several pieces by Lin that are part of the Confluence Project. 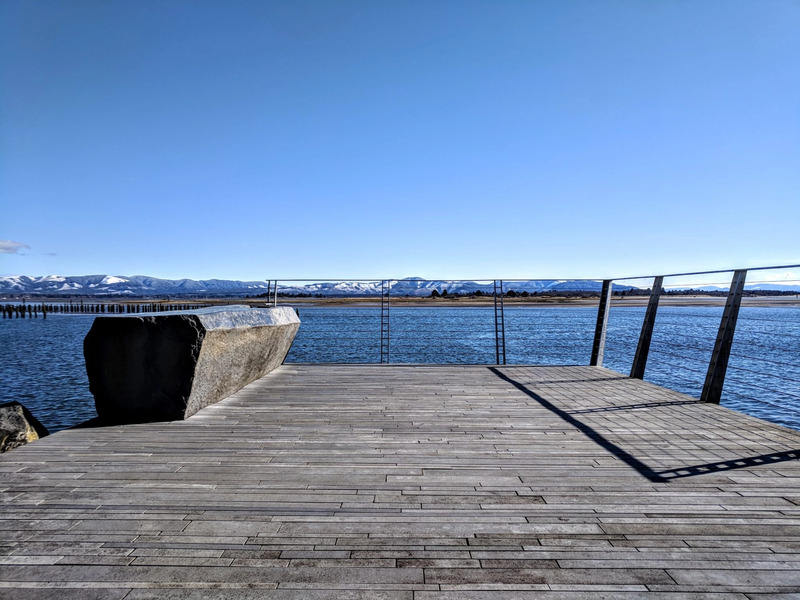 These art installments include a basalt fish cleaning table, an observation deck overlooking Baker Bay, a cedar circle, a boardwalk, and the amphitheater trail. The artwork commemorates Chinook stories and songs as well as entries from the Lewis & Clark journals. Maya Lin artwork is marked on the park map, and you can visit the Confluence Project website to learn more about the art installments at Cape Disappointment. Why is it called cape disappointment? Captain John Meares, a fur trader, is responsible for Cape Disappointment’s depressing name. But he certainly wasn’t the first to find it. The Chinook people had been there for decades. Meares also wasn’t the first (or last) Euro-American explorer to name the basalt landmark. A little more than a decade earlier, Spanish explorer Bruno Heceta named the cape Cavo de San Roque and recorded a bay that he believed to be the “mouth of some great river or some passage to another sea”. When Meares failed to find the mouth of the Columbia River himself, he wrote “We can now with safety assert, that no such river as that of St. Roc exists, as laid down in the Spanish charts”. Then, he bestowed the enduring name “Cape Disappointment”. Cape D was to be named one more time by Captain Robert Gray who claimed possession of the river’s north riverbank for the United States. He named Cape Disappointment “Cape Hancock”, and the name stuck around well into the nineteenth century. Meares is also responsible for naming Mt. Olympus (previously known as Santa Rosalia) and the Strait of Juan de Fuca. Though known for his exploits, he had a messy reputation as a liar and nearly started a war between England and Spain when he tried to start a fur-trading post at Nootka Sound on Vancouver Island. 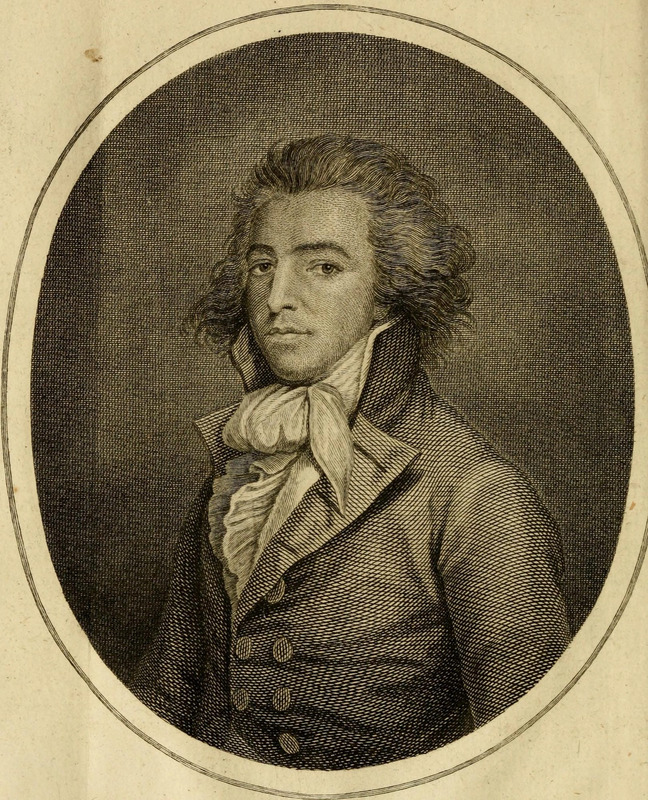 Captain John Meares (1756-1809). Image from Wikimedia Commons.